Happy Thanksgiving From The Crew at The Helmet Shop. See what special deals we have for you this Holiday Shopping Season!! This offer is for any college student or government employee that wants to receive a Visa Gift Card for up to $20 or store credit for up to $40 just by posting on your university or government blog. The Sena FreeWire Bluetooth Motorcycle Adapter is coming!!! Use your complete infotainment system on your Gold Wing or Harley Davidson without any wires. This is the device everyone has been waiting for. The FreeWire is due in stock this September. Call 80-630-6434 for additional information. When it comes to choosing the helmet communication system that meets your needs, it helps to get an opinion from a trained specialist. 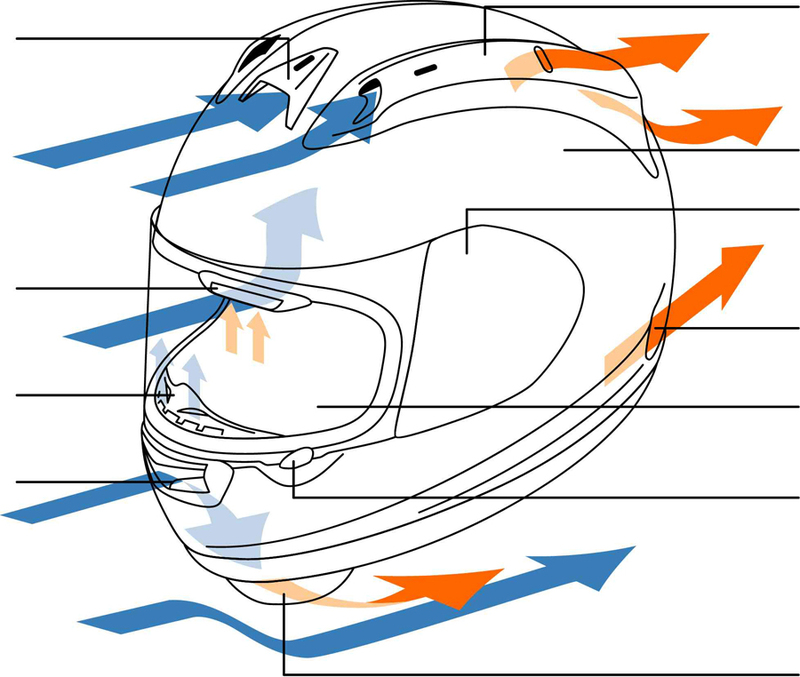 For the past 23 years, The Helmet Shop has been helping customers determine the best helmet communication systems for the type of riding they do. The type of motorcycle you ride, the number of people in your group, whether you need to plug in or plan to go wireless, are just a few of the questions we may have when helping you make the best decision for your new helmet headset. Our support team is available at 1-800-630-6434 Monday - Saturday 10am-6pm EST and Sunday 10am-3pm. The Helmet Shop of Daytona Beach is having a great sale this Easter on motorcycle helmets and more. See the details below. Cardo is giving away 4 SmartPacks. Like their Facebook page to win. Proper care of your motorcycle helmet can have a big impact on how long it will last and how it may perform in the case of an accident. Misuse and improper storage can shorten the shelf life of your investment. How often you need to replace your motorcycle helmet can depend on a number of factors. The initial quality, where you store it, and how you treat your helmet will be determining factors as to when it is time to invest in a new motorcycle helmet. The number one, most important quality of your motorcycle helmet, is a proper fit. There is a helmet out there for you. You just need to decide where your comfort level is. Happy Halloween to all our customers from The Helmet Shop. As always, we have some spooktacular savaings on all of your top brand motorcycle helmets and motorcycle accessories. To sweeten the cauldron, The Helmet Shop is holding it's first ever "The Great Pumpkin $1000 Sweepstakes". All you have to do is use the Coupon Code : PUMPKIN during checkout. Motorcycle Helmets with built in Bluetooth, not always the best choice. When it comes to motorcycle helmets and bluetooth devices, there are three types. There are helmets that the manufacturers have pre installed bluetooth headsets. There are helmets that the manufactures make â€œBluetooth Readyâ€ and promote a specific brand of bluetooth headsets. Then thereâ€™s your helmet, with no headset. Which should you choose? What is the best Investment? Twenty Two years of selling helmets gives us some insight we would like to share. March 6th, 2015 is the official start date of Bike Week 2015, but the roar of the motorcycles is saying it has already begun. And why not, the weather in the Daytona Beach area has been perfect for riding. Remember to support your local Small Businesses like ours this weekend. Now is the time to save big on Cold Weather Riding Gear from The Helmet Shop. Take advantage of our Black Friday Discounts on a wide selection of Snowmobile Helmets, Heated Riding Apparel, Heated Grips and more. It is time again for Biketoberfest in Daytona Beach. The Helmet Shop is gearing up for their 23rd Biketoberfest in Daytona Beach, Florida. This will be the first Biketoberfest held at the new Helmet Shop location at 1310 S Ridgewood Ave in Daytona Beach from October 16th - Ocyober 19th, 2014. The Nolan N40 Helmet has been given a facelift and is now available to the public. The original Nolan N-40 helmet was almost perfect. It was one of the only motorcycle helmets that offered rider both a face shield and an open road visor. The newly designed N40 includes some of the most advanced features available in the motorcycle helmet industry. Cortech's 2015 apparel has been released and the new VRX Jacket looks like it might be a nice addition to our inventory at The Helmet Shop. HJC just released the CL-Ironroad Half Helmet today. This light weight half helmet is likely to be a big hit for us this upcoming Biketoberfest in Daytona Beach. HJC Helmets announces their latest Snowmobile Helmet the IS-MAx II SN. The IS-Max II SN is available in both a dual lens and an electric shield version. The IS-Max II comes in sizes XSmall - 5XLarge to fit the majority of snowmobile enthusiasts. 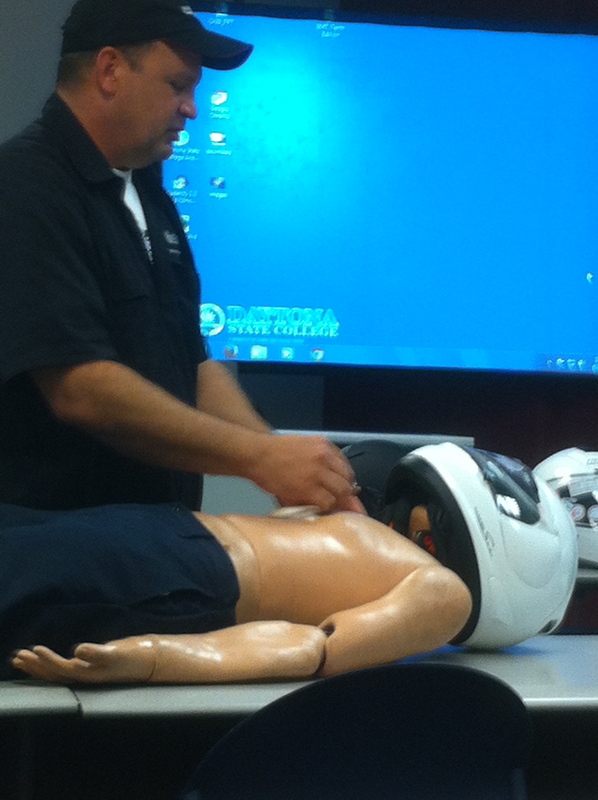 This week, the owners of The Helmet Shop visited the EMT class of Instructor Tim Trorian at Daytona College to demonstrate the latest advancements in motorcycle helmet technology. 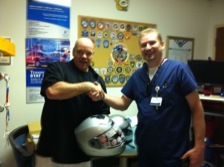 The owners of the Helmet Shop paid a visit to Volusia County's EVAC Ambulance Service, the Daytona College Paramedic Class and met up with the Trauma Center Training Coordinator to showcase the advancements in motorcycle helmet design. 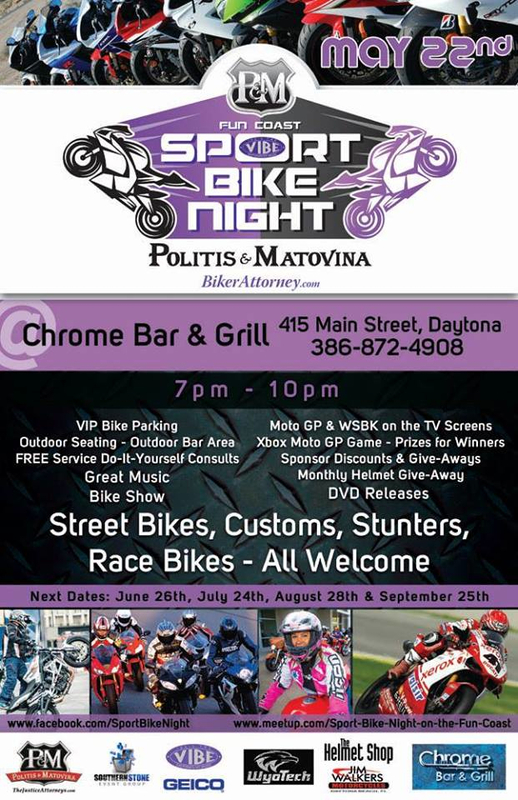 The Helmet Shop, in coordination with Attorneys Politis & Matovina, The Chrome Bar and Grill, Wyotech, Jim Walkers Honda and The Vibe Radio Station, will be participating in the Fun Coast Sport Bike Night in Daytona Beach, Florida starting May 22nd, 2014 from 7pm - 10pm. With today's traffic and hazardous road conditions, even the most experienced riders can find themselves in a motorcycle accident. In this circumstance, prompt and proper treatment can make the difference between life and death. When a rider is rendered unconscious or has a suspected head injury, Emergency Medical Personnel may need to quickly and safely remove an injured rider,s motorcycle helmet. With the Summer months approaching fast, motorcyclists are always looking for ways to remain cool while riding. Let's face it, wearing proper protective gear can be heavy and hot. This is also true when it comes to your motorcycle helmet. Here are 5 ways you can fight the heat and keep your helmet on. Introducing the Sena Prism Bluetooth Action Camera. The Sena Bluetooth Action Camera is the first camera on the market that provides authentic Bluetooth technology. The Sena Prism is the ideal solution for the users who want to record their adventures while capturing their video and voice on-the-fly.